On moving apartments and melting cheese. We have a new apartment. We have the Internet, at last. The landlord has promised that I’ll soon have a new stove. And now that we’ve had our first dinner party in our new apartment, the place feels like home and I can breathe. 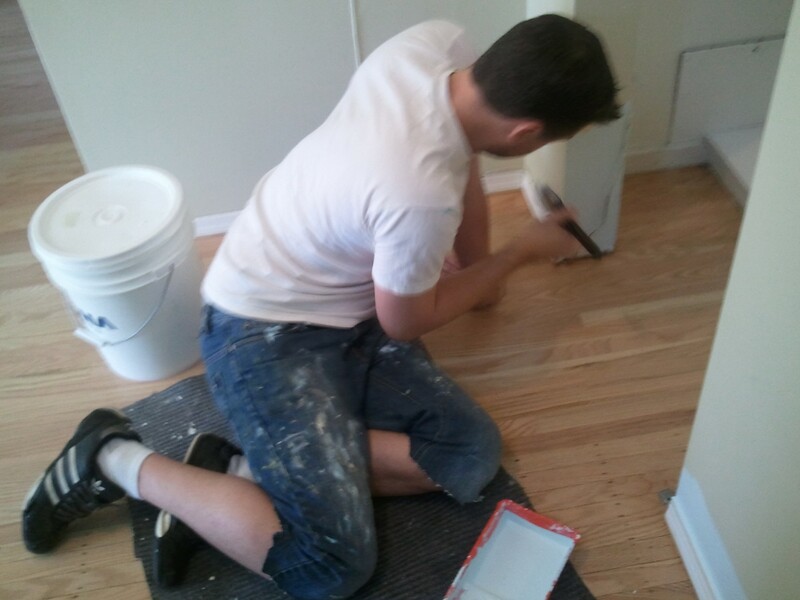 Nick painted the place before we moved in and it’s very blue, so for the first time ever we’re living together in a place that we can describe the colour of using adjectives that don’t also describe bodily fluids. The cat still blends in with all the furniture, but Nick looks better because the walls match his eyes. We have more windows and better light, and we’ll have lots of time to enjoy these things as the rent on the place will prohibit us from spending much on anything else. 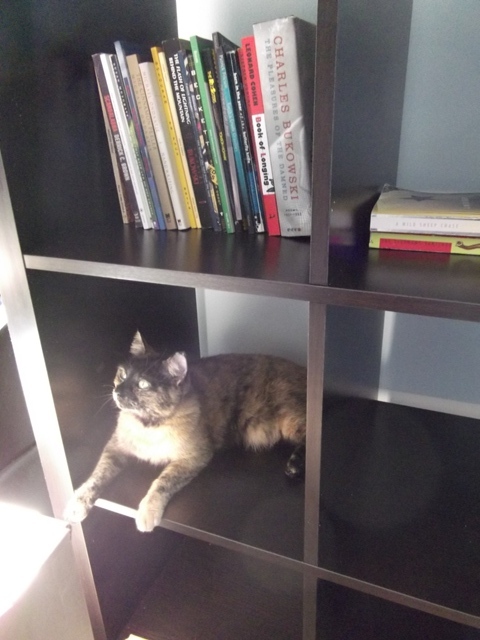 Cat has not settled down since we finished moving in last week because there are so many new rooms and cupboards and hallways to explore, and I hear her little voice from all the corners of the apartment reminding me she’s still here. She checks in once in awhile, but she still has a lot to do. 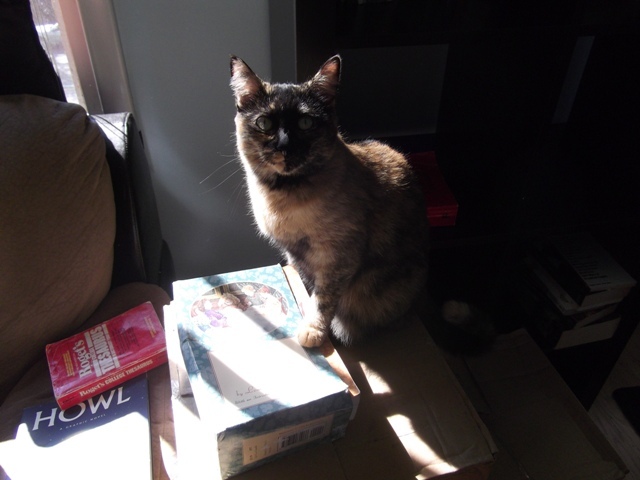 There’s an upstairs to this place, and she has to rub her face on every inch of every step and that takes more energy than a five-pound furball can muster all at once. My kitchen in this new place is the same size as the old one. The advantage is that here I have a window above the sink, and the drawback is that my fridge is half the size. I am twice the size now, having rounded the corner on my thirty-third week with a belly that’s measuring closer to 35 or 36 weeks, so I have yet to start feeling comfortable in my space. It’s hard to relax when you’ve got a habit of knocking crap off the counters or searing-hot pans off the stove at every turn. All of my shirts have stains on them. I wanted to have friends over for dinner, because a feast in a new apartment is like a bottle broken on the hull of a boat; it’s how you make things official. The first dinner shared with people in a new apartment (not eaten out of boxes on the floor, but at an actual table) is the thing that makes the place a real home. Ordinarily my effort would reflect the importance of this, but I am irritable and my back hurts and the more things I have to do, the more complaints I am able to muster. 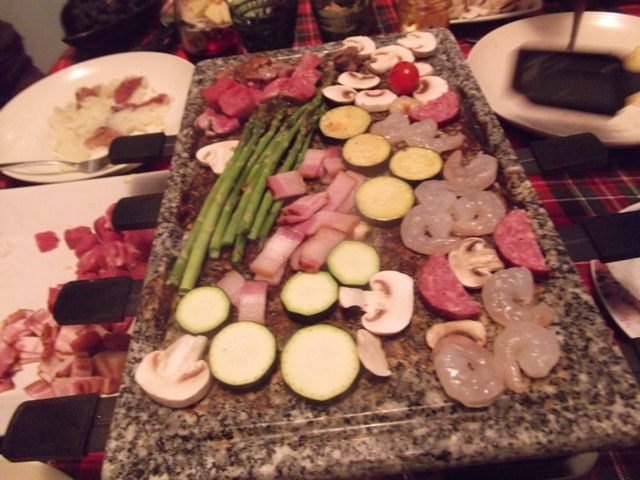 Fortunately, we have a raclette. 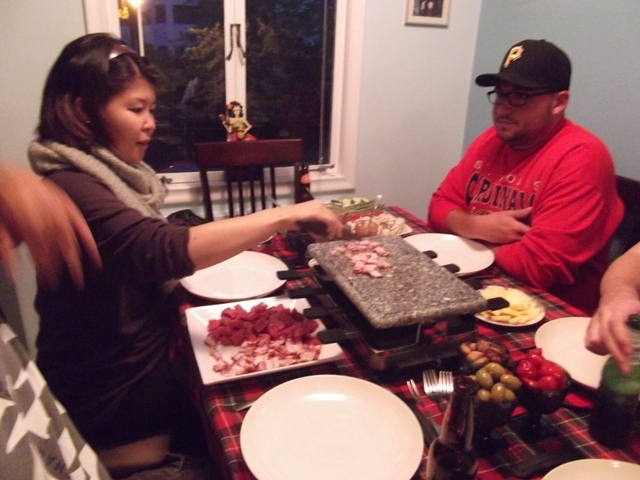 A raclette is a wonderful thing. It’s like a fondue pot, except instead of dipping things into melted cheese, you pour melted cheese over things. 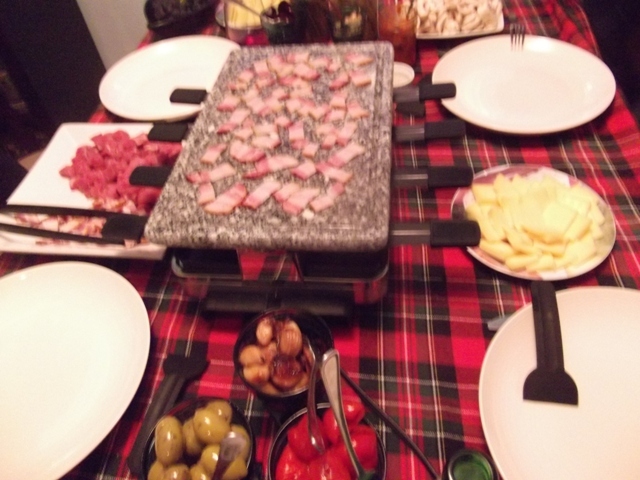 We learned about raclette a few years ago in the home of my friend Chelsea and her then-boyfriend, an accented Swiss-German named Marco who was a Physics professor by day and a drummer in a Celtic punk band by night. Raclette is both the name of the apparatus and the type of cheese, though we used good white cheddar and it was delicious. Your guests will cook their meat and veggies to taste on top of the raclette grill while melting cheese under its broiler. They will eat their cooked morsels with potatoes and drizzle the melted cheese over top. They will do this more times than they can count, and at the end of the meal they will be very sleepy. To make a proper raclette meal, you boil more quartered red or white potatoes than you think you’ll need, and slice quite a lot of cheese. I boiled a pound of potatoes per person. 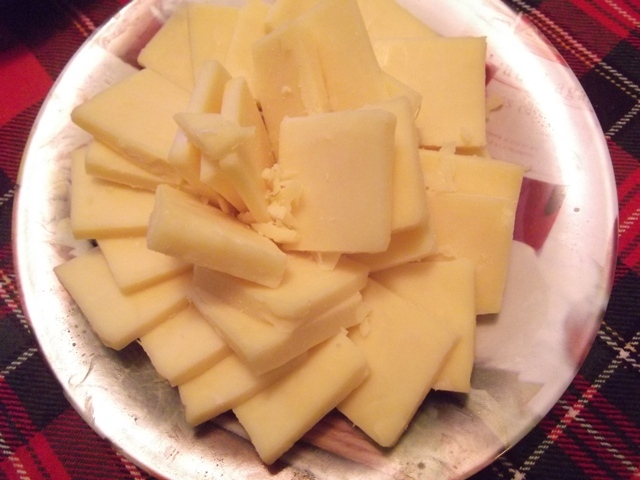 There were five of us, so I sliced two pounds of cheese. 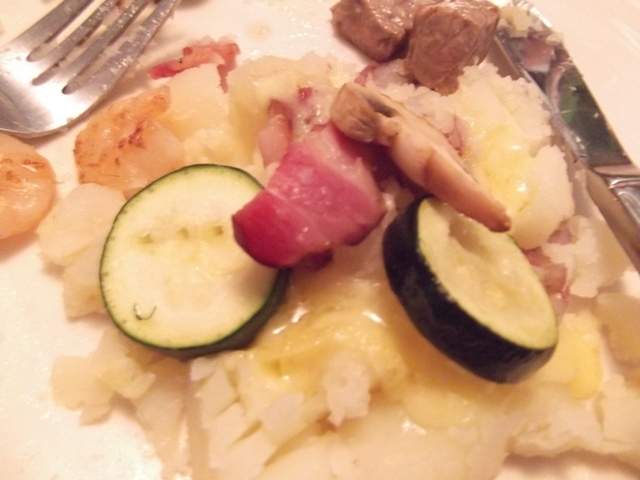 We had asparagus, mushrooms, zucchini, and grape tomatoes for our veggies, and cubed steak, chopped bacon, shrimp, and rounds of Farmer’s Sausage for our protein. Start with the bacon to lube up the grill a bit before cooking the other things. If you’re a vegetarian, wipe the top down with a bit of olive oil before starting. Because a meal based on the holy trinity of meat, cheese, and potatoes can be, uh … rich, set the table with little bowls of acidic, pickly things, like olives and beet pickles and peppadews and gherkins and cocktail onions – whatever you have in your pantry will do, but if you have to make a special trip, make use of a store’s olive bar, where you can buy just a few of everything for not very many dollars. Little ramekins with good salt, freshly ground pepper, and Dijon mustard round the dinner out. The whole thing ends up being an inexpensive, rather European feast, and it is made better with wine or good cold beer. It is a warming treat in the wintertime. You will want to have Beirut playing in the background, and perhaps you and your guests will wear sweaters and it will be snowing. I have bought raclettes as wedding gifts, and know that you can get a pretty good one for $50, less if there’s a sale. Department stores sell them in their small appliance sections, and better cookware stores sell more expensive versions (up to $250), with heavier-duty grills. We have a fancy one, because my parents bought Nick a raclette for Christmas the year he discovered his obsession with it. Ours serves eight people, but Nick would happily melt cheese every night on his own if cheese in Canada was cheaper and if he didn’t have to clean the raclette every time. What about you? It’s been awhile. How are you warming up to fall? Are you embracing the idea of sweaters and meals of cheese, or putting it off as long as you can? How are you doing? < Previous A perfect day for pickle-making. 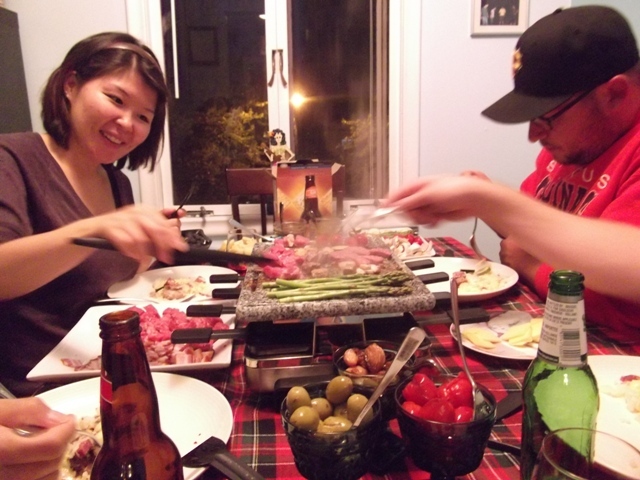 I just found out last week that you can actually rent a raclette machine from Les Amis!! I think that knowledge will change my life (especially since LAF is just a few blocks away). Melted cheese, I’m ready for my cheese coma. 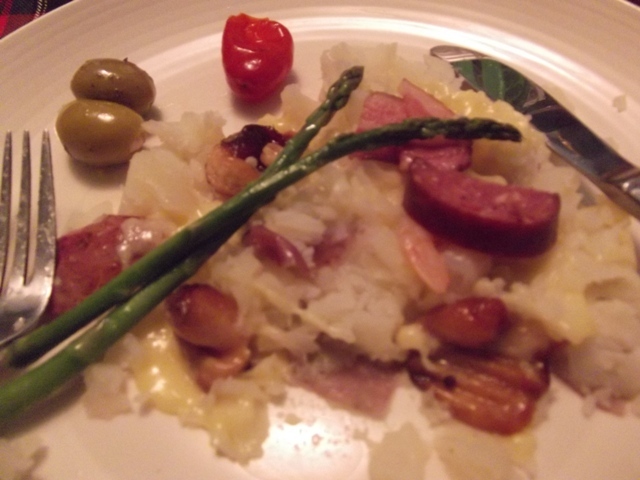 We just recently moved apartments as well, and it’s getting colder, and melted cheese on most things is delicious, and moved by your post I just went on craigslist and someone is selling a raclette, never used, for $40. Boom. First dinner party planned. Thanks for the inspiration! 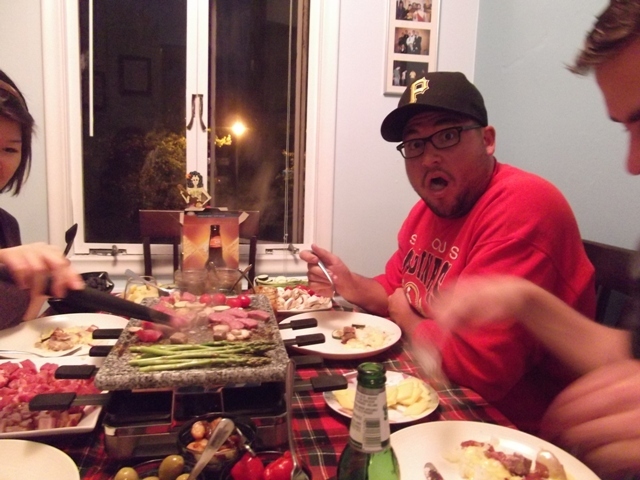 Thanks to you I just bought a raclette grill. Sounds like a great way to keep my 4 kids socializing at the table. Also sounds delicious (anything with melted cheese sounds delicious). Kickpleat: Ooh, and you can get the actual raclette cheese there too! This could be the start of a very bad habit. Carly: So glad you’re going to try it! Congrats on the new place. The smell of bacon and melted cheese should warm your new home nicely. Marie: I am glad you’re going to try it too! It’s definitely kid-friendly, probably more so than fondue and just as much fun. Yummy!!!! I need to get one! I’ve dreamt about it since your dinner party last spring? I “re-found” your blog when I was moderating all the memberships for Food Bloggers of Canada and I was so happy. I stumbled upon you about a year ago and thought you were great and then couldn’t remember the name and despite googling, I never found you again! I will be back regularly now. I have a friend with one of these, and the idea of tabletop cheesemeals sounds like heaven. I am looking forward to Fall. The Husband put in a request for beef and stout pie with a bluecheese crust for the first cold day. However, being South Georgia USA, it could be Christmas or later before that happens. We may have to fake it by turning the A/C down, or sitting in the walk-in fridge at the lab. Beef and stout pie? Blue cheese crust? Where is the recipe? You need to share. We’re grey and rainy now, and it will be winter by the end of the week, I’m sure of it.